DULLES, Va.Mar. 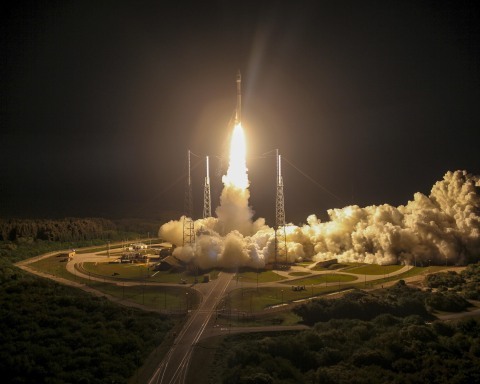 13, 2015-- Orbital ATK, Inc. (NYSE: OA), a global leader in aerospace and defense technologies, provided critical hardware for the United Launch Alliance (ULA) Atlas V vehicle that launched four, first-of-their-kind NASA satellites last night from Cape Canaveral Air Force Station, Florida. NASA s MMS (Magnetospheric Multiscale) is a Solar Terrestrial Probes program comprising four identically instrumented satellites that will use Earth s magnetosphere as a laboratory to study the microphysics of three fundamental plasma processes of space weather occurring in near-Earth space: magnetic reconnection, energetic particle acceleration and turbulence. These processes can interfere with GPS signals and radio communications and cause excess radiation, forcing airlines to divert their flight paths. NASA s Goddard Space Flight Center in Greenbelt, Maryland, designed and built the MMS satellites and will also be responsible for mission operations. Witnessing yet another successful launch of an Atlas V serves as a reminder of how much Orbital ATK values our partnerships with ULA and NASA, said Ron Grabe, President of Orbital ATK s Flight Systems Group. Our highly engineered composite and control products play an important role in ensuring dependable access to space and affordable innovation for our customers. Orbital ATK produced the 10-foot diameter composite heat shield, which provides essential protection for the first stage of the launch vehicle. The assembly was fabricated using advanced fiber placement manufacturing techniques at the company s Iuka, Mississippi, facility. This is the 53rd Atlas V launch using Orbital ATK-built composite structures. This flight also marked the 18th successful flight of the Orbital ATK retro motors. Eight of these solid motors supported separation of the spent first stage. The Atlas V retrorocket is built by Orbital ATK s Defense Systems Group at its facility in Elkton, Maryland. The ULA Atlas V rocket flew in the 421 vehicle configuration. For the NASA MMS satellites, Orbital ATK s Space Systems Group built the observatory decks, spacecraft decks and bulkhead support panels at its Beltsville, Maryland, facility. The company delivered the aluminum honeycomb structural panels directly to NASA s Goddard Space Flight Center.